Obama NSA Speech: How he learned to stop worrying and love surveillance. 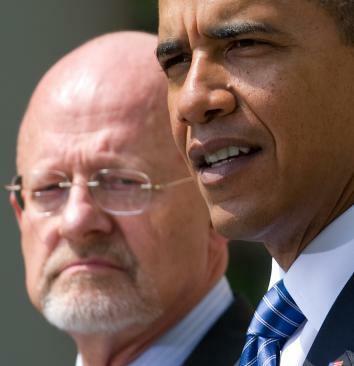 President Obama with James Clapper, his then-nominee for director of national intelligence, June 5, 2010. How does a politician go from criticizing surveillance programs to defending them? What happened to Barack Obama? Peter Baker tackles that question in today’s New York Times. The article is worth reading not just for the story it tells, but for broader lessons about how our thinking—in this case, a president’s thinking—can be reoriented (or, from a critic’s perspective warped) by unbalanced conditions and inputs. Whatever your views are on the National Security Agency—and mine have been all over the lot—try to set those aside for the moment and just notice the events and circumstances that affected Obama. Mr. Obama was told before his inauguration of a supposed plot by Somali extremists to attack the ceremony, what David Axelrod, his adviser, called a “welcome-to-the-NBA moment before the first game.” Although the report proved unfounded, it reinforced to Mr. Obama the need to detect threats before they materialized. “The whole Somali threat injected their team into the realities of national security in a tangible and complicated way,” recalled Juan C. Zarate, the departing counterterrorism adviser to Mr. Bush who worked with the Obama team on the threat. So while instituting additional procedural changes, Mr. Obama undertook no major overhaul of the surveillance programs he inherited. The key words in this passage are in the throwaway clause: The report proved unfounded. The intel people weren’t telling Obama about something that was going to happen. They weren’t even telling him about something that could have happened. They were telling him about something that, as it turned out, never would have happened. It wasn’t a threat. It was an unfounded report of a threat. That’s the power of the intel briefing, as an instrument of bias. The briefers don’t just tell you about the actual threats. They tell you about the plausible or even possible threats. You get the largest possible picture of the terrible things that could happen if our agencies aren’t able to monitor communications. A former Obama aide tells Baker that as president, Obama “has more information than he did” as a senator. But what, exactly, is information? Obama doesn’t just get information about reality. He gets information about possibilities. Is that information? Or is it speculation? This is the other side of the coin. The intel people tell the president everything about what terrorists might be doing. But they don’t tell him everything about what the intel people are doing. They choose—and slant—the balance of information. That doesn’t mean they’re dishonest or sinister. My impression is that they’re quite conscientious. But in some ways, that makes the slant more worrisome. It’s systematic. Just weeks after the inauguration, Judge Reggie B. Walton issued a secret ruling reprimanding the NSA for violating its own procedures. But when Mr. Obama was briefed, the case did not stir consternation. The president’s team instructed the Justice Department to fix the problem, but “this was not a central concern and he was very quick in knowing how to deal with it,” said a former administration official. … When civil liberties advocates visited to press him to do more to reverse Mr. Bush’s policies, Mr. Obama pushed back. “He reminded me that he had a different role to play, that he was commander in chief and that he needed to protect the American people,” recalled Mr. Romero of the ACLU. Compare those two episodes. Obama gets a warning of NSA violations. No problem: The Justice Department will take care of it. But the Justice Department can’t take care of security threats. Those fall to the commander in chief. Obama isn’t a neutral player in these tradeoffs. His job description makes him feel directly responsible for security, not for privacy. was surprised at the uproar that ensued, advisers said, particularly that so many Americans did not trust him, much less trust the oversight provided by the intelligence court and Congress. … Mr. Obama appointed a panel to review the programs. “The point we made to him was, ‘We’re not really concerned about you, Barack, but God forbid some other guy’s in the office five years from now and there’s another 9/11,’ ” said Richard A. Clarke, a former White House counterterrorism adviser who served on the panel. He had to “lay down some roadblocks in addition to what we have now so that once you’re gone it’ll be harder” to abuse spying abilities. This compounds the bias of the president’s job description. The president also has a personal bias, because he’s the guy in the job. In terms of objectivity, this makes him the worst person to evaluate the risks of presidential power. He wouldn’t have run for the job, or won it, if he didn’t have unnaturally high confidence in himself. And that self-confidence colors his willingness to empower the executive, no matter how hard he tries to filter it out. These biases don’t invalidate Obama’s decisions about privacy and surveillance. I have a lot of faith in the guy. To be honest, my level of trust in him is, for a journalist, almost embarrassing. But I’m not asking you to share that trust or to reach a particular conclusion about the NSA and its oversight. I just want to show you, through Baker’s article, how, even with the best of intentions, any of us—including the president—can be skewed by position and circumstances.